This post is about a simple volume control wiring for acoustic guitars. It's designed to work with a sound-hole magnetic pickup. Acoustic guitar magnetic pickups usually are coming as sets with a cable, so there is a problem to mount some additional pots. 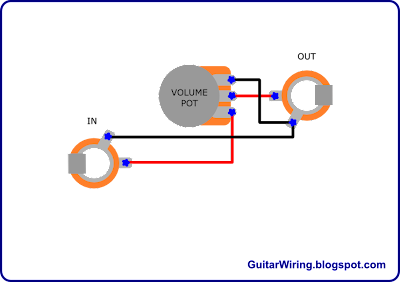 The diagram shows how to make a volume control equipped with jack sockets, so you will be able to connect it with your guitar by simple wires with jack plugs. It's good to make this circuit in some external enclosure. The critical thing in this project is the pot value. I suggest 500K as something in the middle. If it will make your guitar too bright sounding – try 250K. If the tone will be too warm/dull – try 1M. It's very simple, but it can help you in creating your guitar tone.